This entry was posted on Tuesday, January 3rd, 2012 at 5:34 pm and is filed under Physics. You can follow any responses to this entry through the RSS 2.0 feed. Both comments and pings are currently closed. Stephen is a wonderful example of the importance of the mind and the transient nature of the body. He has done what really matters, he has left the world a better place than he found it. Would that we all could make that claim. Is the Big Bang theory 70 years old too? It depends on what you count as the origin of the big bang theory but let’s say Lemaître’s primordial atom in 1931, so that was 80 years ago. Basically, while we are a product of the Universe, understanding it is far simplier than the human equation. 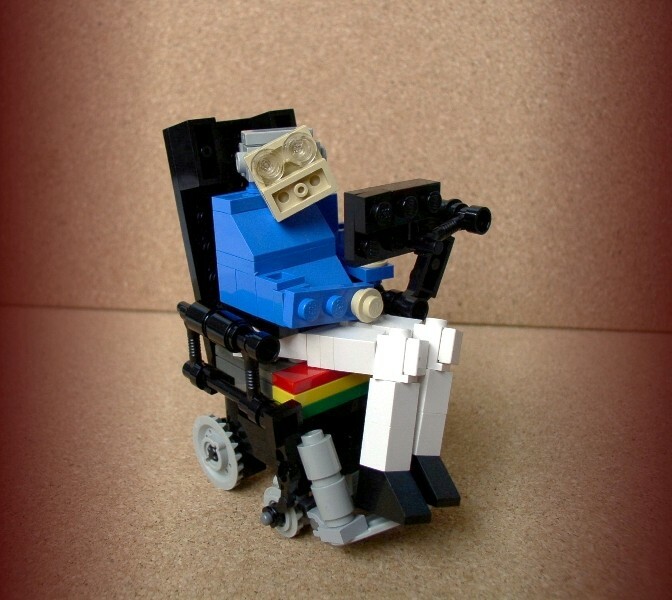 A very neat Lego version of Professor Hawking! If Mother Nature is capable of creating an organism (humans) with such an elegant g factor, shouldn’t it also apply to the Creator of Mother Nature too? What applies to the son must also apply to the Father or else we would have chaos. Happy birthday Dr Hawking. I wish you many more years of aspiring thoughts. I was lucky – as a result of Professor ‘philosophy is dead’ Hawking’s regretable hospitalisation VIP tickets for this free lecture were left uncollected in considerable numbers, so I excitedly gained entry to Lady Mitchell Hall, the first time since my undergraduate days (Corpus Christi College, 1981-1984). Cambridge University’s largest lecture theatre has not changed – and the unimaginatively designed ‘hall’ as opposed to ‘semi-circular’ shape was not helped by the SGI and Intel-sponsored wrap-around banners which resulted in restricted event horizons for those, like myself, seated on the edge of the left-hand side of the auditorium. Lord Rees of Ludlow (formerly Professor Sir Martin Rees), Astronomer Royal and Master of Trinity College, Cambridge (a major investor in the Arms Trade). The sight-line problem was a major disadvantage given the continuous use of illustrative slide and film shows employed by the speakers – 2pm: Introduction by Professor Sir Leszek Borysiewicz, Vice-Chancellor; 2.10pm: Lord Rees, ‘From Planets to Universe’; 3pm: Prodessor Saul Perlmutter, ‘Supernova, Dark Energy and the Accelerating Universe. 2.45pm Afternoon Tea Break. 4.25pm: Introduction by Dr Nathan Myhrvold, CEO, Intellectual Ventures; 4.30: Professor Kip Thorne, ‘Black Holes: A New Golden Age’; 5.15pm: Introduction by Justin Rattner, Chief technology Officer, Intel Corporation; 5.25: Professor Stephen Hawking ‘A Brief History of Mine’. 6pm End of Symposium. Sir Richard Branson, representing Virgin Galactic – offering space joy rides to the massively wealthy from December 2012 – a self-confessed Hawking groupie. Did you know that Stephen Hawking first realised there ‘was something wrong’ with him when he could no longer row a sculling boat in Spring 1962, in Oxford. There can be no greater inspiration for a lapsed marathon single sculler to get back into a boat – for the sheer joy of it. Yes, I am the first to admit that despite my consternation at Hawking’s headline-grabbing ‘Philosophy is dead’ declaration (made, I assume, to draw attention to his 2010 book ‘The Grand Design’) he remains a great inspiration to me and has been for many years. As an undergraduate I would often pass him on the shortcut through King’s College to the English Faculty on the Sidgwick Site. It was a troubling and confusing time for me, at least on the academic side. I’d come up to read Geography, changed to English in my second term – and was struggling to reconcile the unmanageable reading demands of the English Tripos (I’m dyslexic) with my mission to become a theatre-maker. Theatre-making won. Without fail Professor Hawking would give me a warm smile as he trundled himself around the town and University in his customised wheel chair. ‘M 21′ painting by Nick Ward (January 2012) – part of a set of 52 divination cards – work in process. He still gives off an encouraging vibe to serious and off-beat types caught up in the sometimes restrictive and reactionary Cambridge University scene – it can be an intimidating place on account of the incredible people who have made their mark here. Think of John Dee, a Founder of Trinity College, who as an undergraduate translated Euclid into English and directed a production of Pax by Aristophenes in which a scarab beetle was seen to magically fly. It was smoke and mirrors but he was accused of witchcraft – a tag which stuck with him all his life, even as Elizabeth I’s official ‘magician’ (a term synonymous in Elizabethan England with ‘mathematician’). Or think of one of Hawking’s heroes, in the generation following John Dee, Sir Isaac Newton, who introduced the idea of a gravitational force of attraction – and that the mutual attraction between two objects is inversely proportional to the square of the distance between them. The applications of Newton’s gravitational law (Philosophiae Naturalis Principia Mathematica, July 5th, 1686) required no modification by NASA programming engineers at Cape Kennedy in the late sixties. Or think of James Clerk Maxwell, Cambridge University, whose Electro-Magnetic Theory of 1867 predicted the existence of Quasars and pulsars in the cosmic background radiation – now known as ‘Hawking Radiation’. ‘M22′ painting by Nick Ward (from the ‘M Series’ – 52 imprint-paintings inspired by cosmological genius encrypted in the Mayan Calandar in which the 260-day ‘tzolkin’ (Olmic origin) coecides with the 365-day ‘Haab’ system. The dual calandar system comes back into step every 52 Haabs. Mayan cosmology spans breathtaking time-spans and is thought to have enjoyed a Golden Age around 800 BC. The Calandar starts 13 August 3114 BC and ends 22 December 2012. This does not mean the world is going to end, it simply means that we move from the Fifth Age to the unknown zone – The Sixth Age. Exciting, Mr Branson. Hawking remains an enormously inspiring figure – I was so energised (and troubled) by yesterday’s fascinating series of talks that I hardly slept last night for the following reasons. 1, With hoping that Professor Hawking is ok as he inches towards his unavoidable death. 2, With visualising the colliding black holes, singularities (beyond mathematical rationalisation), imaginary time, warped space, etc, etc. 3. Above all I was kept awake by the impications of Hawking’s highly publicised siren-call for massive increases in funding in US-European investment in space exploration – and the total lack of an ethical perspective in yesterday’s proceedings with respect of the linkage between ‘space exploration’ and the arms trade – war. Not a mumour of ethical responsibility: nothing of the Wheeler and Oppenheimer Princeton drama of the late 30s onwards, for instance. My fears were heightened when an item came on the BBC World Service at 2.50am in which China has announced fullscale entry into the new space-race. What the hell is Russia up to? Sir Richard Branson was at the seminar giving his Virgin Galactic a plug and claiming he’ll have Hawking in space for a joy ride before next Christmas. Virgin Galactic will be the downfall of Richrad Branson is my prediction. If only the ruthless and likeable old business hippy were to invest in schemes to protect earth-bound wisdom systems our fragile planet would be a safer place and (with the spin-offs) his worldly wealth would increase exponentially… such is Hawking’s power. He’s honest about it too. He told us in his pre-recorded lecture (spanning childhood to the inevitable collapse of the Euro) that his main reason for wanting to understand the Universe (No Boundary Proposal) was to become master of it.